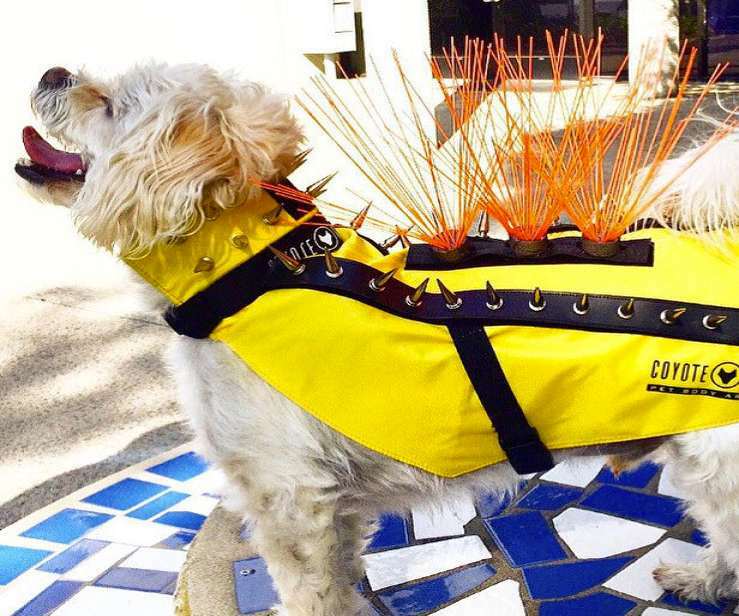 Sure, a CoyoteVest will make your lap dog look like a mohawked Mad Max BAMF, but that's just a happy side effect. 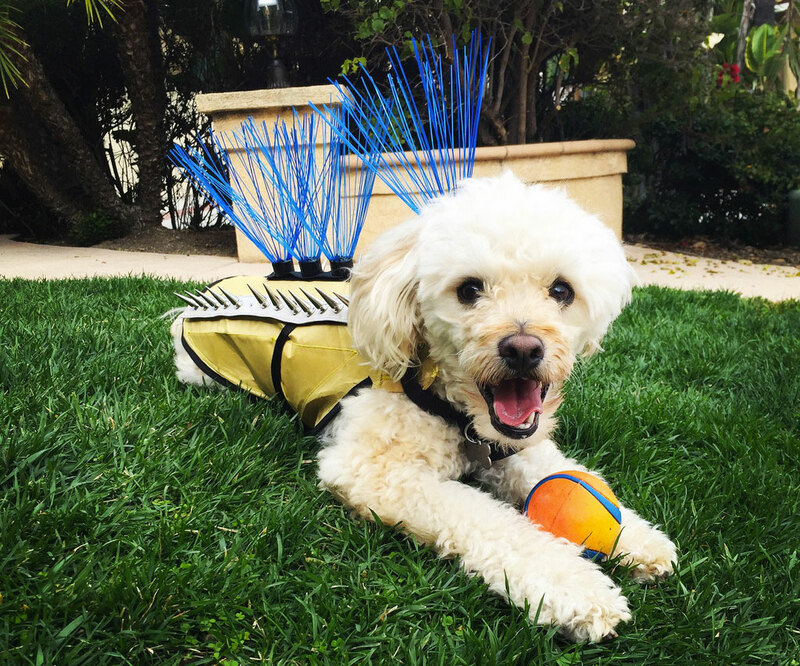 The self-described "Pet Body Armor's" primary purpose is to protect your little buddy from an attack. Bigger dogs, nasty raccoons, and other wild animals can sneak up or decide to pounce on pets suddenly, and whether you're there at the time or not, you may not be able to stop it. As the CoyoteVest's name suggests, coyote attacks in particular are on the rise in the US. What's a 7-pound puggle or a maltipoo going to do to combat a vicious low-level wolf? How about stab it, poke its eyes out, and zap it back to the hole it crawled out of, all while keeping his own delicate doggie flesh impenetrable? CoyoteVests are made with layers of Kevlar and lined at the neck with 12 x 1" spikes. Presuming an attacker goes for your dog's jugular, the spikes and triple laminated Kevlar collar will make a successful bite very difficult. 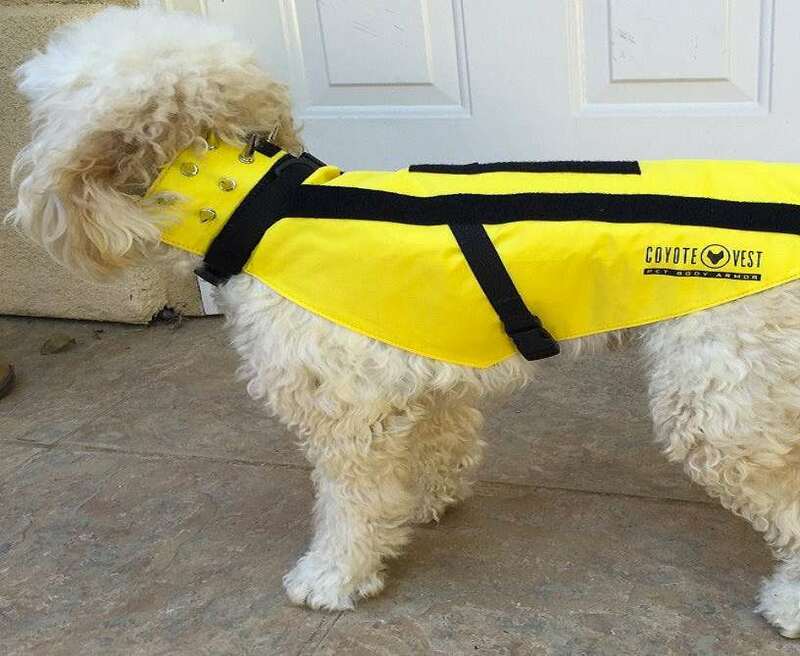 The Kevlar spanning the rest of the vest provides further bite protection, and though it doesn't cover a dog's entire body or guarantee survival, it does shield key organs and the most common areas a predator would lurch for. CoyoteVest says that despite Kevlar's puncture resistance, the flexible 200 denier fabric is breathable and comfortable for dogs to wear. It snaps on and off with 2 quick-release buckles and has an adjustable waist belt and collar to fit a variety of dog shapes and sizes in the 10 to 20 pound range. 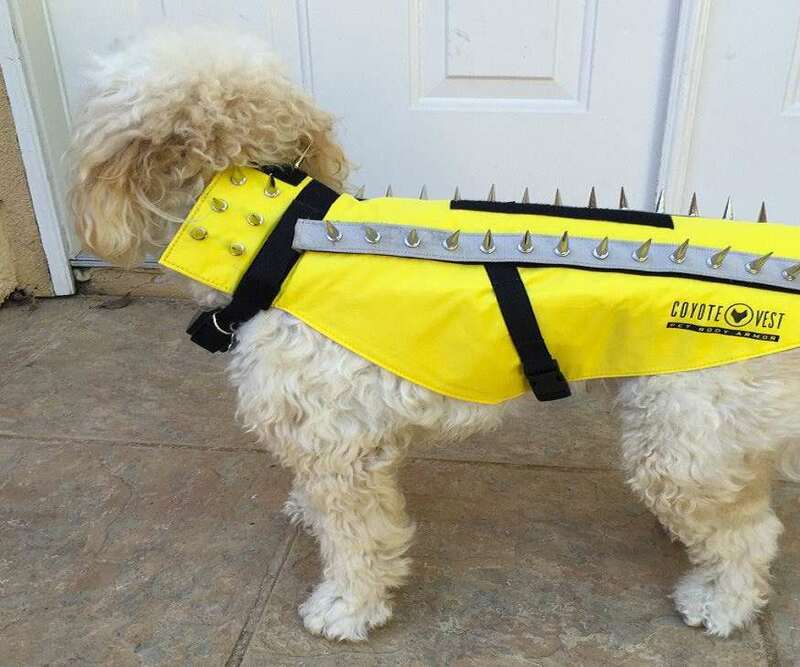 If you want further Fluffy protection, you can also upgrade the standard CoyoteVest with CoyoteWhiskers, CoyoteSpikes, and a CoyoteZapper. 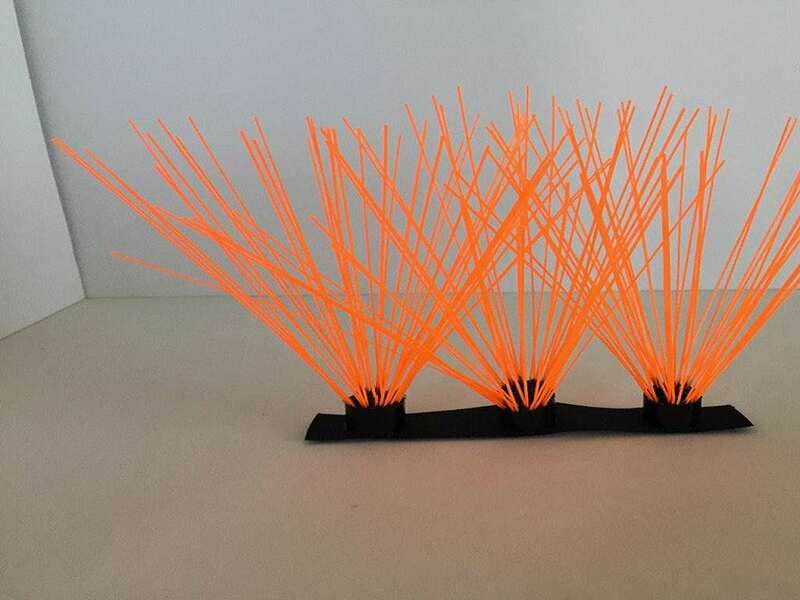 The Whiskers are bright orange nylon bristles similar to a broom's. They're ultra-light and soft enough that they won't hurt your dog (or you) but stiff enough to aggravate an attacker and force it to close its eyes. The Spikes are the same as those built into the CoyoteVest neck, but designed as strips that attach along the sides of it, running neck to haunch. The CoyoteVest Starter Pack includes the Vest, Spikes, and Whiskers. In the event an animal picks up your pooch and tries to run away with him, the CoyoteZapper lines the vest with bzzzzt! panels like those used in pet training collars, and arms you with an RC device that will deliver a powerful (yet non-lethal) shock to the predator's mouth when detonated (your dog won't feel it).